From listings for local parks and playgrounds to collections of the best contractors in town, WordPress directory listing themes provide the tools you need to generate a solid directory and offer free space or charge people for premium listings. 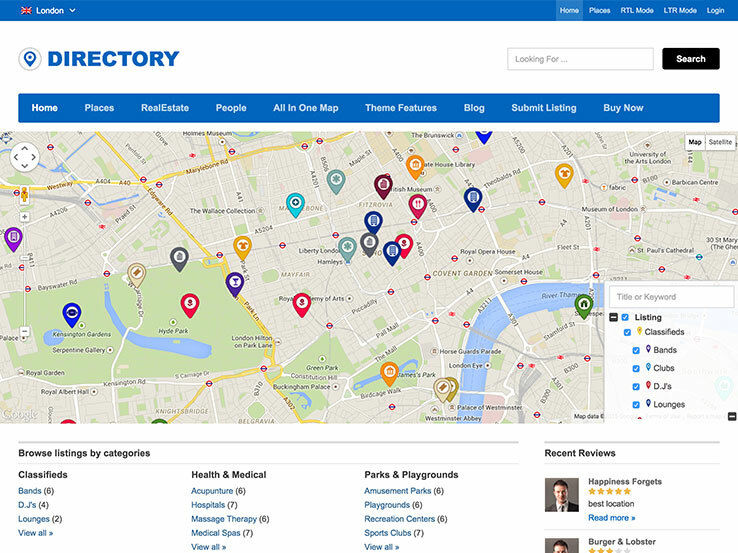 A directory works well as a moneymaking opportunity since you can solicit local and online businesses to pay for ads or listings, and it’s wise to keep a lookout for the best directory themes to ensure your website attracts visitors. What Does a Directory Site Need? A quality directory site will have the essential features needed to make it a rousing success. One of the most important features is integration with Google Maps so you can easily display locations to any directory listing. Front-end submission forms allow the acceptance of user-generated content. Monetization options should also be included either via dedicated sections for ads, charging for directory listing submissions, or a combination of both. Responsive design and customization options are also must-haves. Why Get a Directory Theme? 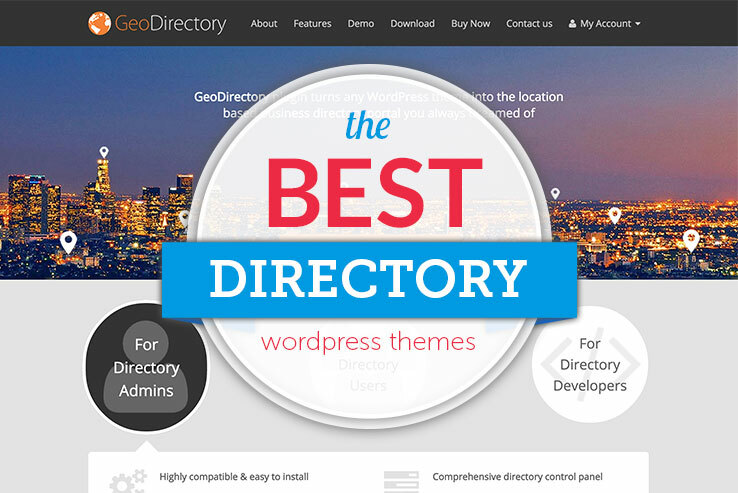 Directory themes are especially useful for small business owners such as car dealerships or real estate companies. Even if you’re not a small business owner, you can create one to list all the events in your area, present various tourist attractions, feature the best restaurants in your area, or any other type of service that generates interest. As long as you have a viable idea, a directory website is a great way to generate additional income. 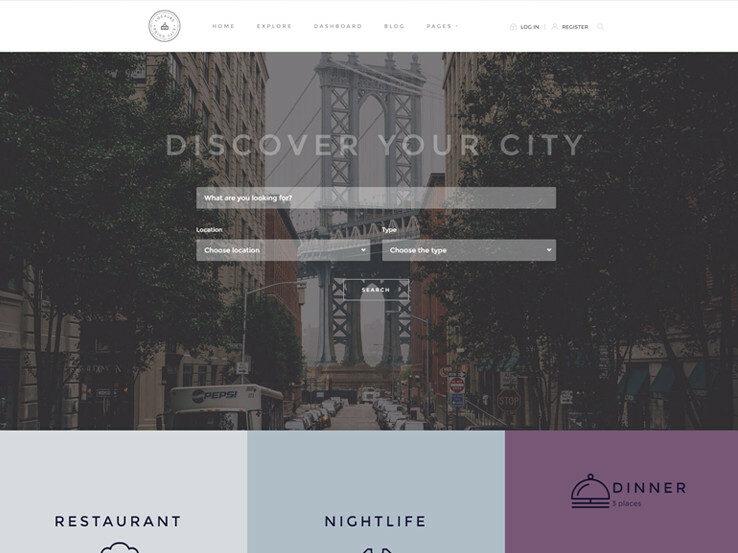 Locales is a great WordPress theme for building a directory of local businesses such as pubs, eateries, cafes, shops, restaurants, and more. It combines useful directory functionality with an elegant modern design. Your users get an intuitive front-end dashboard where they can create their listings, manage their profiles, and view their current listings and favorites. 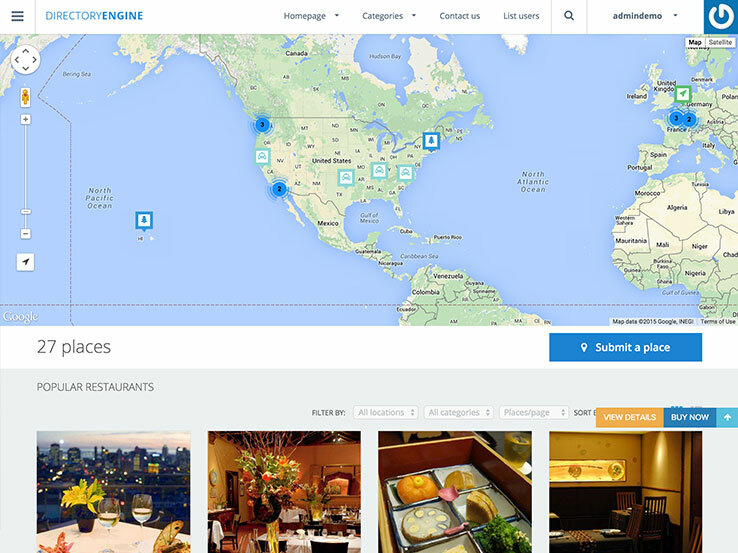 Users can easily add their location with Google Maps, social media links, gallery images, and more. The template comes with custom pages for creating pricing tables and offers, which are great for monetization. 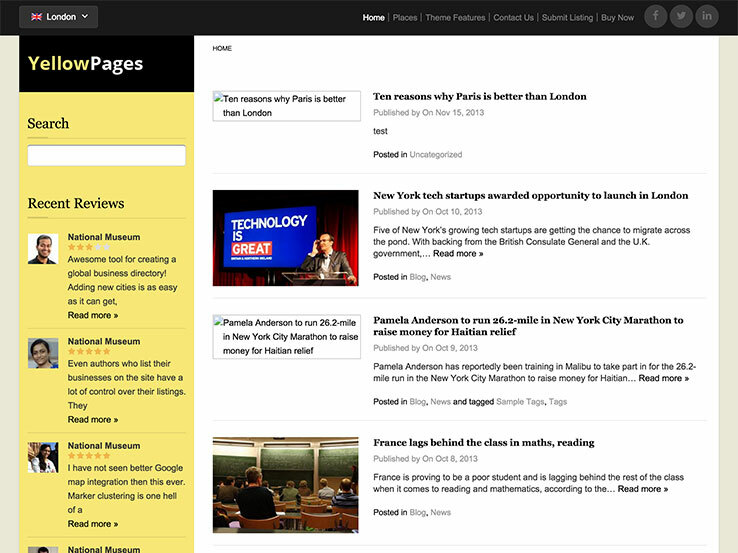 In addition, Locales includes a gorgeous blog section that can be useful in driving traffic to your directory site. 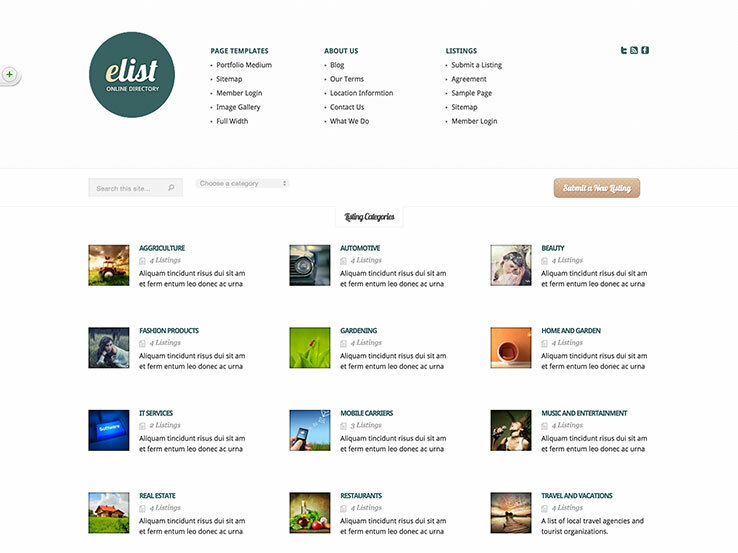 In terms of front-end functionality, the eList Directory WordPress Theme provides a wonderful interface for users to tap into the directory and submit their own listings without having to create an account; users simply submit a listing from the front-end. The eCommerce integration proves unique compared to some other directory themes since you can always decide to charge your users for premium listings. Organizing your posts and pages isn’t time-consuming or frustrating since you can use shortcodes for customization. The theme comes with several page templates and is even localized so you can translate the text for your local users. 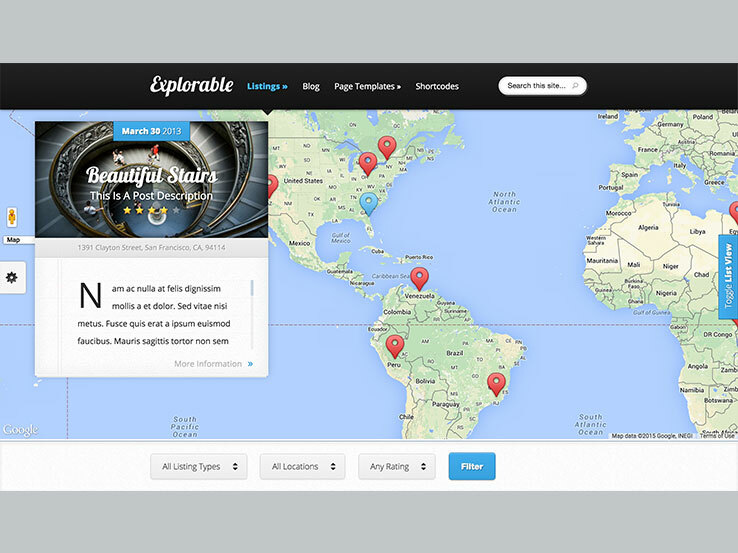 The Explorable directory theme is another option from Elegant Themes, and they always seem to know how to make it easier for beginner web designers. It utilizes locations so that all of the posts are pinned on a map, depending on where the listing occurs. Local business directories work well with the theme, and many people even use it for travel guides. A strong component is the user rating system, which allows people to rate directory listings with stars. 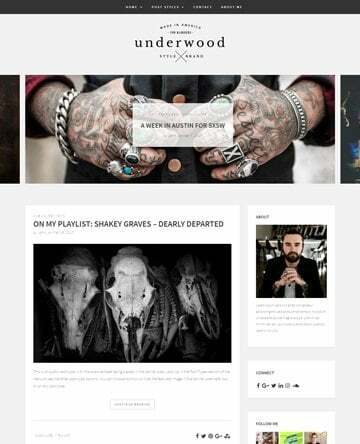 The theme’s responsive nature is a plus–users can view the website on just about any device. Unlimited colors turn your site into a customization machine, meaning that even if someone else uses this theme you can make it look a little different. Finally, each listing is placed into a filtering system so your visitors can find what they are looking for easily. 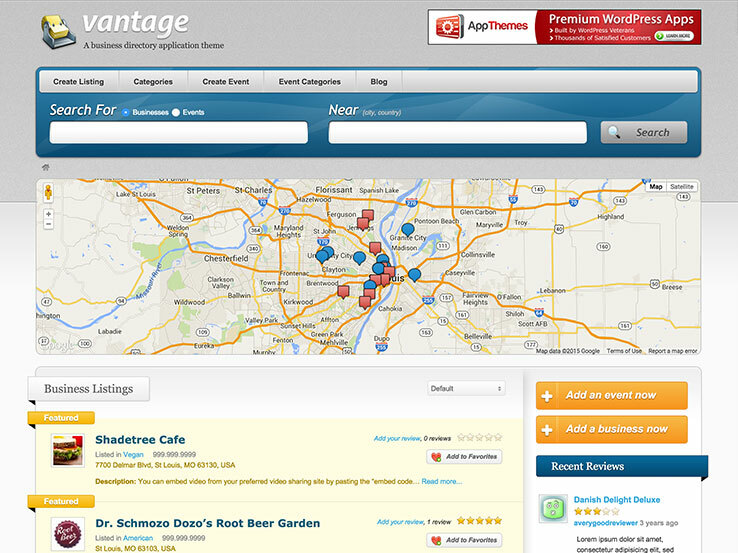 The GeoTheme strives to work as a Yelp clone with a few distinct differences. To start, the theme comes packaged with an Android and Apple app. Not to mention, you receive native code for the two apps so you can customize them however you desire. The theme delivers geolocation features for both the website and mobile apps to reach out to those who are walking or driving around in a particular area. 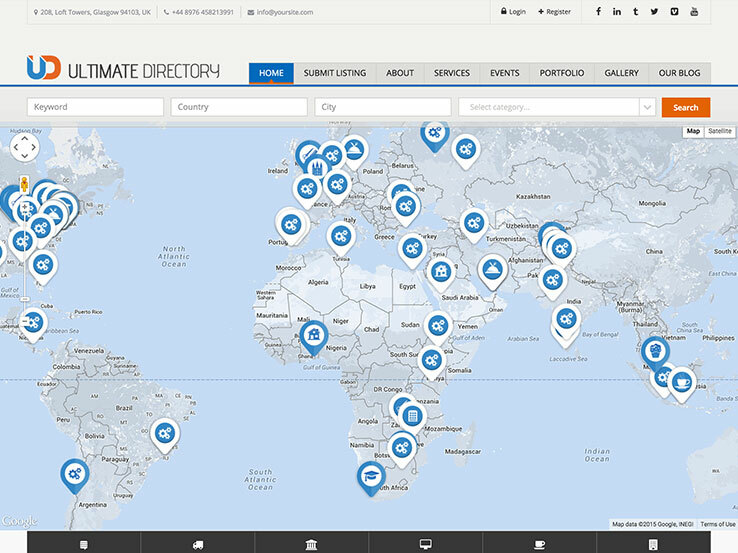 Many directory themes provide Google Maps functionality, but this one offers an extendable map for easier viewing. You can also connect to your social accounts and incorporate sorting options to provide the ultimate directory search environment. Not only do you receive a responsive environment, but the Directory theme by Templatic was actually created by real directory owners with years of experience in the market. The front-end submission forms make a sleek interface for your users to submit and manage their own listings. The pricing packages allow you to make money from your directory by generating a simple payment system when someone creates a listing. 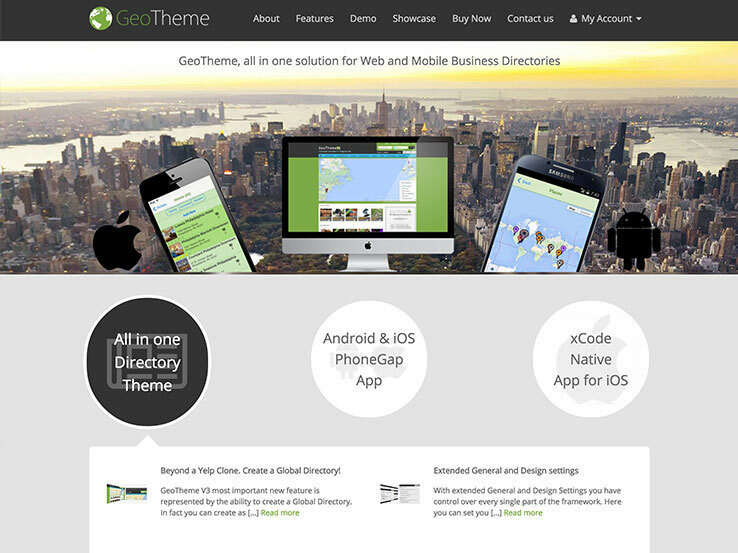 The basic idea behind this theme is to start small, then expand to a global directory. You can always add new add-ons that invigorate your website. For example, you might think about including event managers or directory listing ratings systems later on. 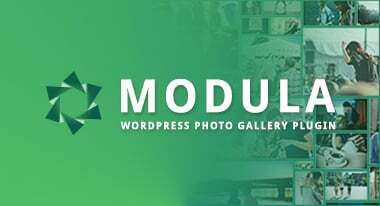 The DirectoryEngine WordPress theme is one of the few directory themes where you can generate a web site by shifting pre-designed content modules. This is similar to a drag-and-drop interface, so it serves the beginner market well. It’s also worth pointing out that the theme provides a mobile interface, making it easier to reach those mobile customers. This theme provides a simple interface for when you want to charge for a single listing or if you’re interested in asking users to sign up for premium plans. The developers also thought about further monetization because you can sell ad space without having to program in the ads yourself. With payment gateways, sidebar customization, and SEO support, you can’t go wrong with DirectoryEngine. We all remember the Yellow Pages, but what was it that made that company so successful? If you take a look at the traditional Yellow Pages online layout, the company knows what customers want in terms of navigation and interface. This theme aims to duplicate that directory with intuitive classified listings for your online business. The YellowPages theme is a child theme for the Directory CMS theme, but that generally means that you can customize it more than a standard theme. It works well, as it’s designed for people to land on the page, find what they want, and even rate their favorite places around town. Users can go to the front-end to submit new listings, and you have the power to control everything from the back-end. Optional add-ons are available, and you can always make money from additional mediums such as payment plans, recurring payments, and one-time coupons. 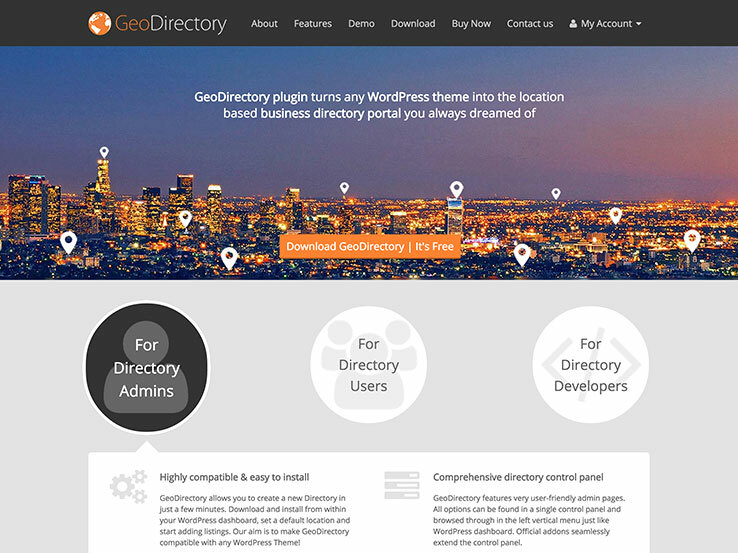 The GeoDirectory theme makes it easy for you to install and manage your own directory with a powerful and intuitive control panel and lightweight features. User registration is available on the front-end, from which people can manage their own listings. Users also have features for creating tabbed image galleries and PDF uploads. SEO capabilities are included, and you can translate the site to make a global directory of online businesses. If you plan on expanding the look and feel of your directory, this theme allows that with add-ons and plugins for events, multi-locations, pricing, claim listings, advanced search, and more. 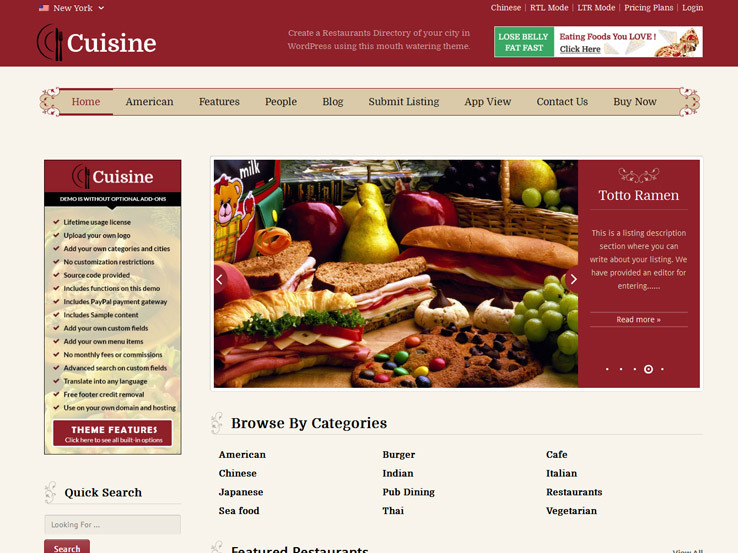 The Cuisine theme serves as the go-to option if you plan on creating a WordPress directory for local restaurants. 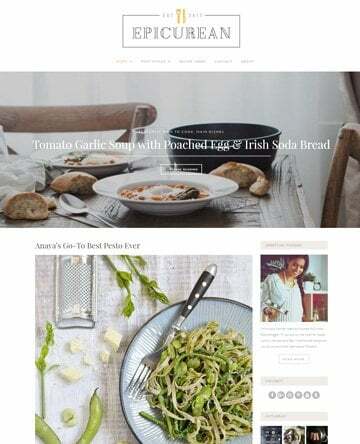 The responsive Cuisine theme works as a child theme for the Directory CMS theme, meaning that you can always include additional add-ons for expansion. The graphics and fonts fit well with restaurant branding, and the global directory comes with thousands of countries and cities for customization. Make money with various pricing packages, create and manage content from the front or back-end, and even offer coupons for users who want to list in your directory. 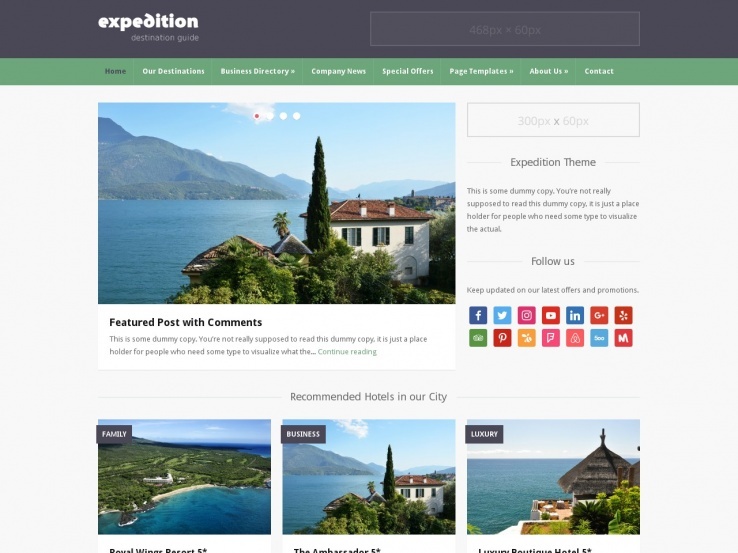 The Expedition WordPress directory theme comes from WPZoom and is particularly designed for people interested in making travel directories. 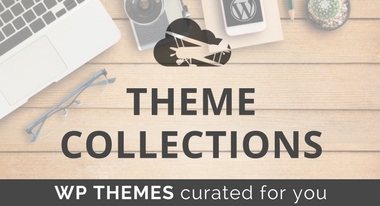 The theme works off of the easy to use WPZoom framework, so customization is a breeze, and the homepage slideshow is unique to the directory market. Widgets are offered to drag and drop throughout your homepage. You can even quickly change your colors with a color slider. The designers didn’t forget about monetization, as they included a banner management area for selling banner space without forcing you to play around with code. Ultimate Directory serves as a wise choice for those interested in creating directory websites. To start, the theme includes email notification and front-end submission capabilities. User notifications send whenever someone makes a change to their profile. Our favorite part is the drag-and-drop editor, so no one has to play around with code while designing their directory. The customizable search fields add to the features, and you can even offer a Facebook login to expedite the process and increase familiarity for your users. People typically visit directory websites because they have a craving for exploration, and the Explore theme supports that perfectly. 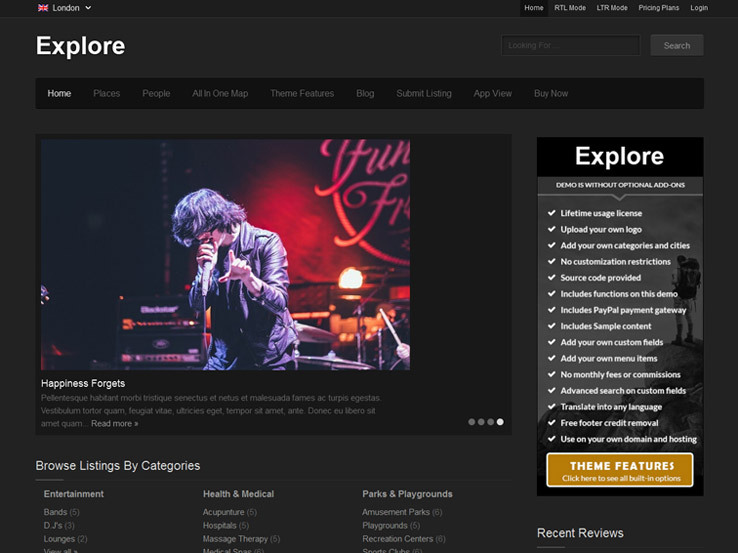 This is a child theme that includes various layouts for your homepage, such as a wide map or the category page grid view. You receive hundreds of preloaded countries and thousands of cities to globalize your directory and reach out to the world. Generate front-end submission forms so your users don’t have to engage with the back-end of your site. Along with responsiveness and a sleek back-end, the theme provides additional paid add-ons to make your site even better. DirectoryS includes a simple, unique feature in that it connects to PayPal for your monetization needs. Advertising spaces help you seek out relevant ads for bringing in more income. The interactive search strengthens the guidance throughout your system, and the Revolution Slider is one of the top slider plugins you can ask for. It seems like the developers had a mind for monetization because this theme comes packaged with premium listing functionality as well. 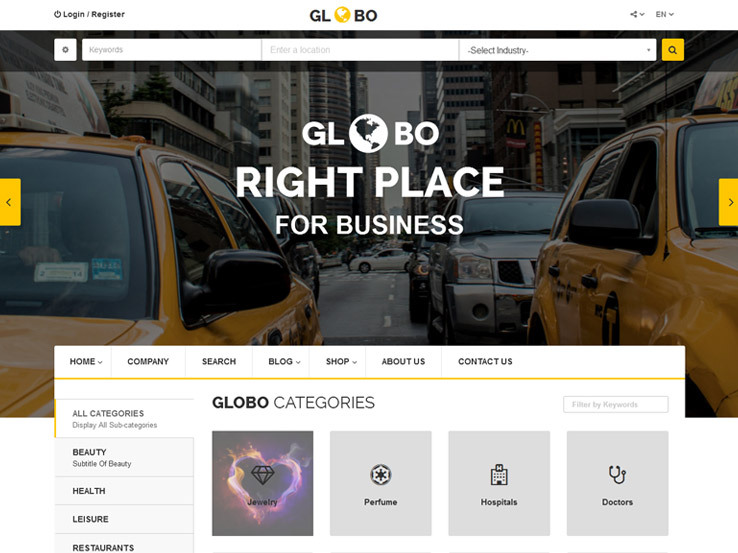 Globo is a directory listing WordPress theme packed with features such as the front-end dashboard for companies to submit their information and modify their pages. The bookmarks are great for users to save the businesses they have looked at in the past, and the unlimited company blocks open up design opportunities for businesses that want to be listed. Globo utilizes geolocation services and includes a blog, portfolio, coupons, and an events page to keep your content fresh for all the users that stop by. Setup a recurring billing system for the businesses that share their information on your site, and even turn your platform into a full classifieds interface. The theme runs through the Stripe payment gateway. 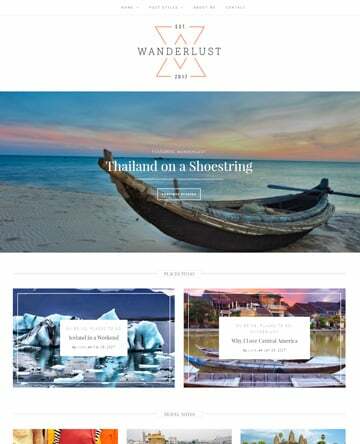 We like this theme because it presents visitors with a huge map as soon as they land on your site that they can use to navigate exactly where they want to go. 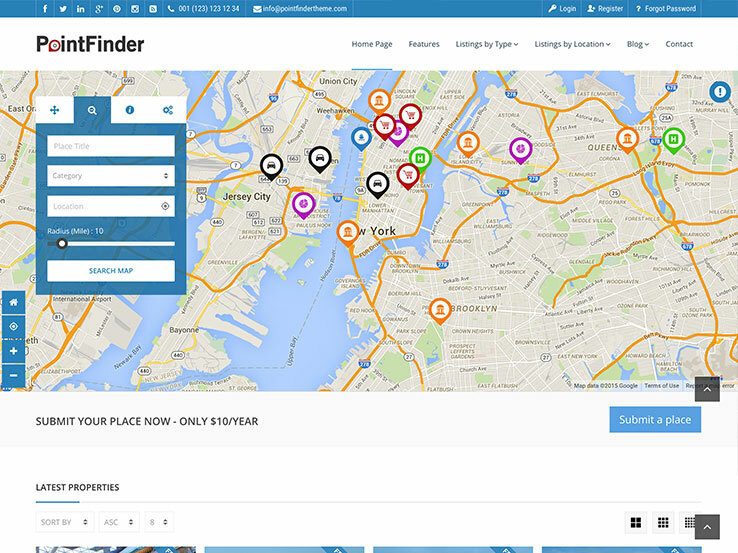 The Point Finder theme also includes a large map on the homepage, along with various search tools to specify user interests. The front-end submission and dashboard expedites the page modification process, and the PayPal payments system allows both direct and recurring payments. Use the Visual Composer plugin if you would like a drag-and-drop interface, and even consider processing your payments through Stripe. The AJAX search and grid functionality is completely interactive for a fast and relevant response time to user queries. The Point Finder theme comes with a geo-location feature for finding where people are currently located, and localization ensures that people who speak different languages can use your platform as well. The email notifications are wonderful for automating your system, and the responsive design ensures that every user can open up the site on a mobile device. 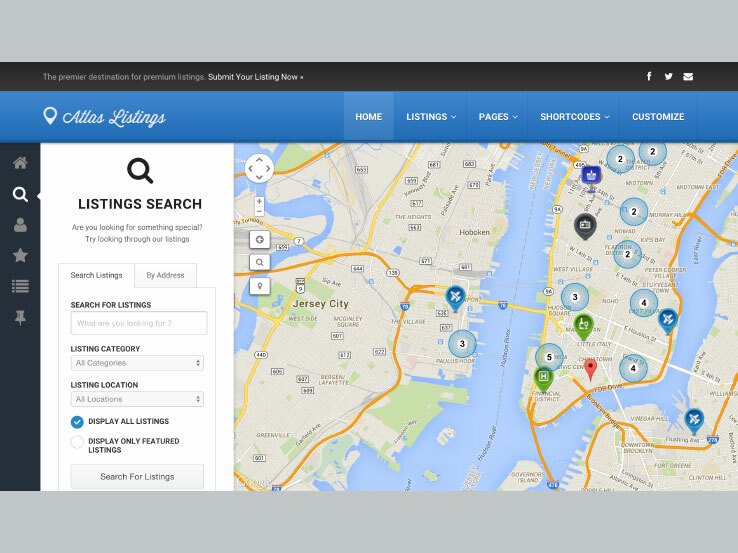 The Atlas Directory option works well, offering an area for people to submit listings on the front-end. 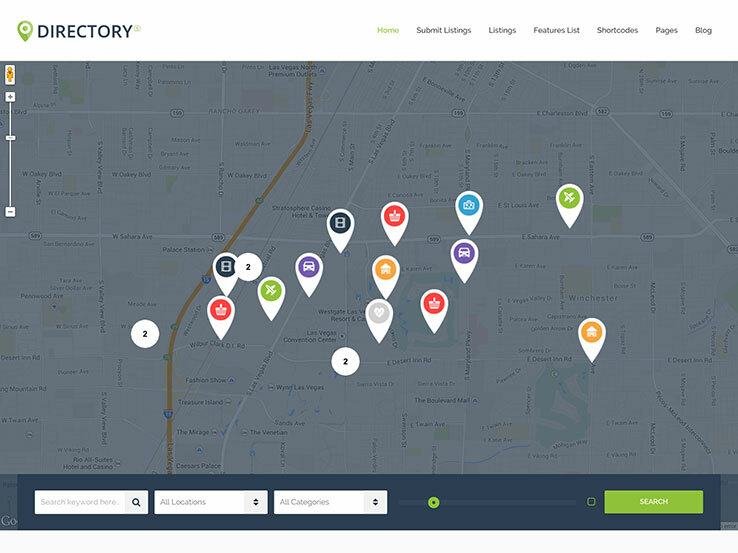 Most of the homepage consists of a large map, where users click to discover what types of businesses are currently in their area. Feel free to create membership packages to bring in more money for your business. After all, a membership is far more likely to bring in consistent income than when you setup a system where people only have to commit to a single payment. PayPal and Stripe both integrate with the Atlas Directory, bringing you the best options for collecting payments. Email notifications are a standout feature for this theme because they help in connecting with your users while also telling you when activity occurs on your site. The front-end dashboard and profile reveal clean areas so people don’t have work with the back-end of your WordPress site. In addition, the LayerSlider plugin is included with your purchase. This is generally a paid plugin, but you gain full access, with settings for overlaying text, buttons, and cool animations. 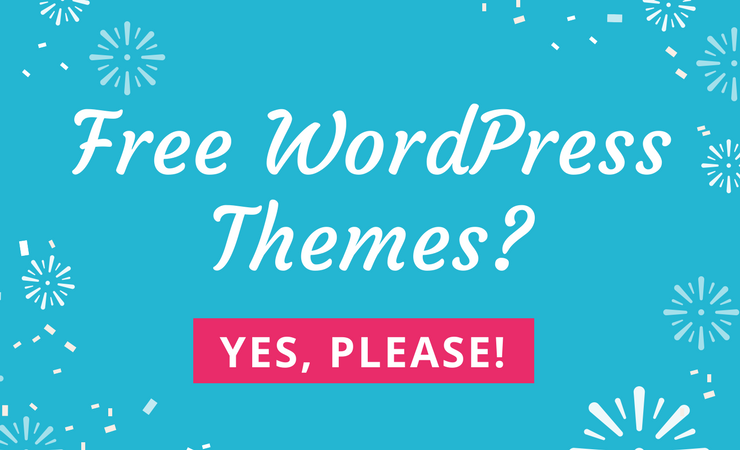 Consider the Vantage WordPress theme if you’re looking for a popular option that’s easy to setup and install. The powerful monetization tools ensure that your hard work is rewarded down the road, while the flexible pricing plans are perfect for giving your users more options and increasing margins for your own company. You don’t have to wait for business owners to come to you; you can entice them to sign up by asking if they would like to claim a listing for their own business. Also, the custom fields and forms brand your site to your own liking. The comprehensive user dashboard offers access to reviews, contact information, site stats, and business listings. Sell featured placements at an increased rate to bring in more money, and ask people to make reviews and ratings to fuel the credibility of your website. The primary homepage is complemented with a Google Map embedded towards the top, and it has a dedicated blog to improve your search engine rankings while also giving out free content to your most loyal readers. Along with social media integration, user favorite settings, and plugins, the Vantage theme has everything you need for a directory site. 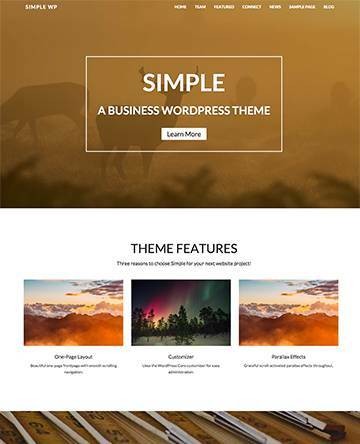 The Business Finder WordPress theme offers a fully responsive and modern design with over 30 elements for constructing and modifying the way your website works and looks. The geo-location tools suggest the right businesses in a user’s local area, and it operates in both kilometers and miles, meaning that just about anyone around the world can utilize the theme, as can the visitors who come to your site. 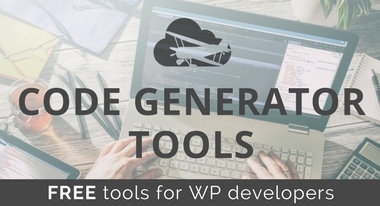 The unlimited customization options help you develop the backend, and the theme is compatible with just about every third-party plugin on the market. What’s more is that you get a drag-and-drop page builder, which improves upon how you design your website, especially if you’re a freelance developer with clients. The included Google Fonts are solid for changing your typography, while the rich snippets are certain to improve on how well Google views your website. In fact, people have been shown to click through more often on listings with rich snippets. Not to mention, you gain access to a Mega Menu, which serves you well when attempting to construct and organize a large website. 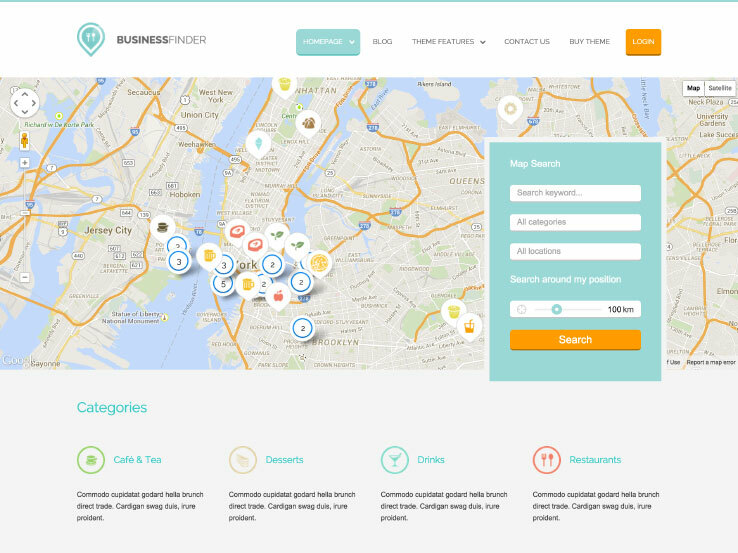 Along with a sidebar manager, WooCommerce tools, and SEO optimization, the Business Finder theme is ready to work for you. Great work. Thanks for sharing. Concrete Blonde rocks. Beware of Themplatic – you don’t get what you think you are getting. The basic Directory/Listing theme is just a framework. To do anything useful you have to buy their own plugins, at additional cost. Hi RPG, Thanks for the note. You make a very good point and it’s something people should be aware of. I found one. Its called directory and you can find in the theme directory. The company name is ketchup something. You can include listify theme, although it is bit expensive. I’m looking for a directory theme where visitors can submit new items/listings using a (custom) form without have to register as a user. Submitted items then have to be approved by an admin before being published on the site. Optionally, companies can claim an item for a fee. Does anyone know what theme would be best for us? Hmm..that is a hard one. I did some searching, but couldn’t come up with a good match. Does anyone have any suggestions that might help us? Let us know if you find one that works. Bussiness directory theme is not mobile friendly, lot of issues with the theme. Hi David, thanks for the suggestion. Thanks for pointing this out, as our readers appreciate the heads-up. Our main focus is to bring quality content to our readers, and we really appreciate the feedback. Thanks for sharing your thoughts with us! What if I wanted a wordpress directory theme to convert to a native app? Is there one that is built for this? Thank you!! !